It was cool enough Monday morning that I decided I’d come in and have another cup of coffee, as much for the warming of my hands as for the chemistry of caffeine. I don’t know what exactly made me glance over toward the woodpile except perhaps the brilliance of the first rays of sun just then spilling over the top of the house. Ah spring! AHHH! I don’t get freaked by spiders. This one freaked me. This particular wolf spider had a leg-span the size of my hand, body the size and thickness of my thumb. I kid you not. And so I forgot the coffee, found my camera, and because the air was still cool and the spider sluggish, I was able to creep up close enough for a couple of shots. He (she?) 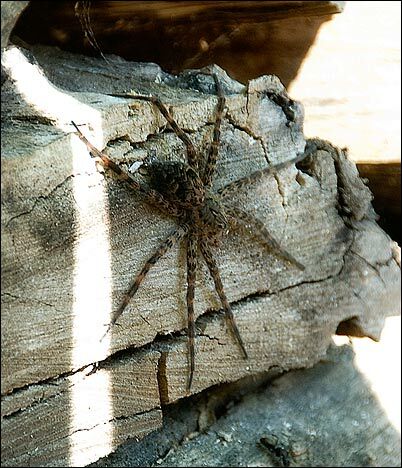 was still there an hour later when I came back out, but when I moved within ten feet of where I had snapped this picture, the spider zipped back into the woodpile, fully warmed by the same sun I was by then enjoying on my way back down to the garden for another round of puttering. Beautiful spider. On a church camp outing when I was in high school, we slept outside in sleeping bags one night. When I woke up in the morning I had an enormous wolf spider – bigger than my hand – resting upon the back of my hand. Bet it was nice and warm there – totally freaked me out! I was too scared to scream. I started to shake from fear and it ran away. Remember the one that bear-hugged my finger when we went camping, say, fifteen years ago? We were beside a creek and I was turning rocks over … You may have forgotten, but I sure remember…. Thanks for the morning heebie-jeebies. Good Lord I would hate to come face to fact with that one!! That is an ENORMOUS spider! I’ve never seen one before, and consider myself fortunate. Must go google it and find out if it’s poisonous. That is HUGE! I wouldn’t have had the patience for a picture. Good for you! I am actually very afraid of frogs and toads. I’m not afraid of spiders, but I don’t think I’d want that one on me! Woooo! Magnificent! I know there are some spiders with bad bites, but most are just beneficial good neighbors all the way (but even I wouldn’t want that one sleeping on my hand. . . .